Girl Guide thin mint chocolate cookies are the key to picking up any girl. Pick up the lady (or dude, I ain’t judgin’) of your dreams at the I am ARG Facebook Page and you can follow my exploits as I go into the final week of Wedding prep on my twitter at @IamARG. Also to all you fellow Canadians, have a great Thanksgiving weekend! See ya on Monday! I love the Lynn shaped silhouette in the background haha! but the art is fantastic. Will Arg survive long enough for the next episode? Will Lynn take away his manhood? Will there be any cookies left? So instead of spending all the time learning to cook, working out, cultivating a personality and getting life experiences from multiple misadventures, all I needed were cookies to get girls’ attention? I’m never going to meet anyone. I like the Lynn outline in panel 3, looks foreboding. I am addicted to the cookie clicker! You sneaky Canadian! ARGH! Maybe it’s just ARG’s rampant sexual magnetism! What? It’s just a suggestion! ARG! I’ve just beat my addiction to CC and you bring me that back? What are you drugdealer? Those are indeed the best cookies ever. Well played Arg. Lynn has no time for this. She wanted the cookies. Lynn in the 3rd panel, must be jealous! Well, thanks for putting the cookie game in the description. 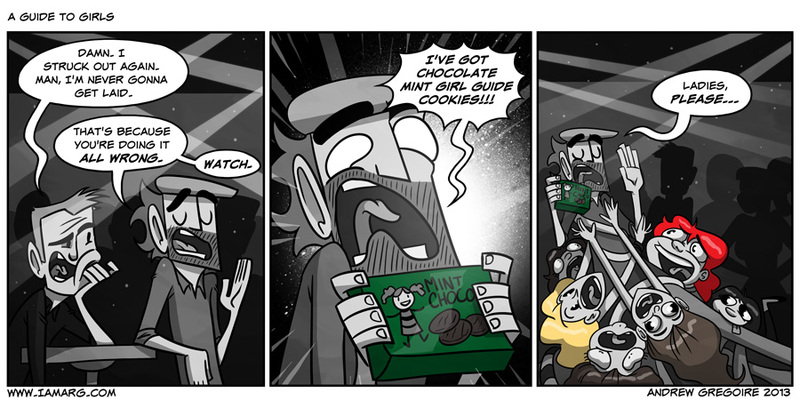 I have officially not eaten or slept since this comic came out because of that darned cookie game.